The National Archives just released 19,045 JFK files. Today was the deadline for President Donald Trump to announce whether files previously either partially redacted or withheld from the public would remain hidden. The President has determined that all information that remains withheld under section 5 must be reviewed again before October 26, 2021 to determine whether continued withholding from disclosure is necessary. Over the past 180 days, executive departments and agencies (agencies) have reviewed all of the information within records temporarily withheld from release and have proposed to the Archivist of the United States (Archivist) that certain information should continue to be redacted because of identifiable national security, law enforcement, and foreign affairs concerns. 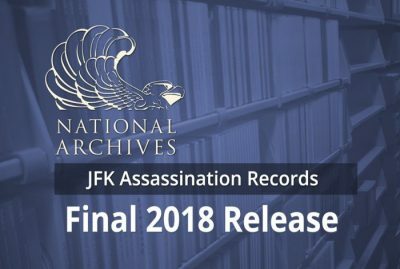 The Archivist has reviewed the information agencies proposed to withhold and believes the proposals are consistent with the standard of section 5(g)(2)(D) of the President John F. Kennedy Assassination Records Collection Act of 1992 (44 U.S.C. 2107 note) (the “Act”). I agree with the Archivist’s recommendation that the continued withholdings are necessary to protect against identifiable harm to national security, law enforcement, or foreign affairs that is of such gravity that it outweighs the public interest in immediate disclosure. I am also ordering agencies to re-review each of those redactions over the next 3 years. The WhoWhatWhy team is currently reviewing the files, and will bring you the latest. Featured image is from National Archives / Wikimedia and Justin Grimes / Flickr CC BY-SA 2.0.